Join OLLI for a docent guided tour of Caravans of Gold, Fragments in Time, the first major exhibition to showcase the splendor and power of the lost kingdoms and commercial centers of Africa. 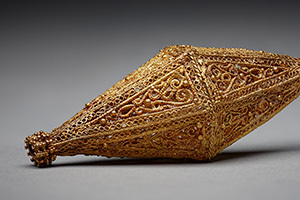 This ambitious exhibition explores the global impact Saharan trade routes had on a medieval economy fueled by gold, upends historical misconceptions, and demonstrates Africa’s underrecognized global significance and influence on medieval Europe, North Africa, the Middle East and beyond. Presenting more than 250 artworks spanning five centuries and a vast geographic expanse, the exhibition features unprecedented loans from partner institutions in Mali, Morocco, and Nigeria, many of which have never been presented in the United States. This event is free and open to all current OLLI members. Space is limited. Registration is required. Please read: Space is limited. Registration is required.We will meet at the Block Museum.